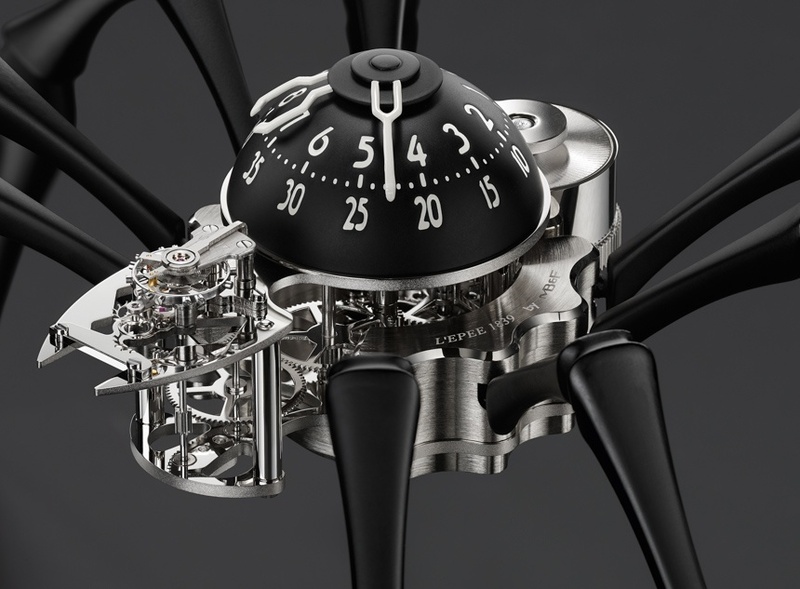 Everyone’s favorite crazy watch maker, MB&F, has just announced a new model, the so-called Arachnophobia. This wild clock hides a L’Epée 1839 movement in the thorax and abdomen of an articulated spider. Based on the famous Louise Bourgeois sculpture Maman, the spider has injection molded legs and a unique escapement mechanism on the spider’s back. You have to use a special key set and wind the eekie-ookie monster. ￼The spider’s head and torso is a modified high-end L’Epée clock movement boasting a power reserve of 8 days. The body’s black dome and white numerals display the hours and minutes. At either end of Arachnophobia’s abdomen, important mechanical processes take place: the head houses the regulator with its oscillating balance wheel (and a set of jaws), while the other end contains the mainspring barrel powering the movement. Attached to the abdomen are the eight articulated legs. Those legs will make Arachnophobia stand tall on a desk… but like any spider, it can also be installed on a wall thanks to an ingenious mounting system. If the clock gives you the creeps don’t worry… none of us will be able to afford one. The limited edition pieces cost $15,900 in steel and $18,200 in gold.